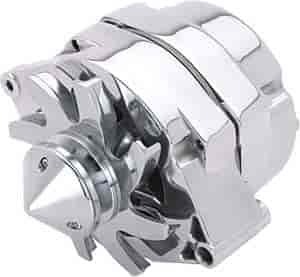 Powermaster 27297 - GM 12si-Style Alternator Polished "Smooth Look"
Powermaster 27295 - GM 12si-Style Alternator Polished "Smooth Look"
For the enthusiast who likes shiny parts and thinks chrome is the wrong way to go, we have your solution! We have assembled a premium, polished-aluminum, 100 Amp, 1-wire alternator and added a billet aluminum pulley and fan for a truly matched appearance in both luster and style. We took the guess work and sweat out of assembling the correct parts and did it for you. Ideal for the street rodder or street machiner who truly doesn't believe in the old motto, "If it doesn't go, chrome it!". Does JEGS 10105 fit your vehicle? 10105 is rated 4.7 out of 5 by 6. Rated 5 out of 5 by Nam Vett from Looks sharp and works great Bought when I upgraded to electric fans and aluminum radiator for a 75 corvette. Needed the extra amps, and this fit the bill. Rated 5 out of 5 by 68ray from solid construction Very nice quality fit perfect, only negative for my application the ground wire ended up on top and detracts a little from a clean look. Rated 3 out of 5 by Fitz33 from Polished Alternator Product is working as intended but quality of Polishing job was marginal. Is this a 1 wire and OEM 3 wire? Yes, this is a 1 wire hook-up and is easy to connect without using the stock connector.